It's King Kong to the rescue when a giant robot threatens to destroy Tokyo. The action begins when the conniving Dr Who builds a robot Kong in order to retrieve a highly radioactive element for his mysterious benefactor, Madame X. 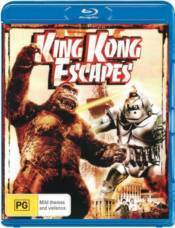 When the robot proves less than reliable, the devious duo scheme to kidnap the real Kong from his remote Island home of Mondo. Interfering with their plans are the heroic trio of U.S. Commander Carl Nelson, Lt Jiro Nomura and Kong's current crust Lt Susan Miller. It's up to them to outwit the greedy ape-nappers.